Bearish central bankers are holding their fire, hitting a pause button one by one and spooking the markets in the process. Investors are anxious because of the evidence that global economic growth is slowing, with the world’s central banks driving home that point. The Federal Reserve earlier announced it would pause for now in its rate-hiking cycle, followed by the Bank of Canada this week and the European Central Bank Thursday. The ECB sparked a market downdraft, promising to hold rates steady for the rest of this year, offering funds to the banking system and cutting its outlook for economic growth in the region to just 1.1 per cent in 2019. The ECB “set the cat among the pigeons, spooking markets with an indication that the euro zone economy is going to get worse before it gets better,” IG chief market analyst Chris Beauchamp said as stocks tumbled Thursday. The U.S. central bank hit its pause button earlier, abruptly ending a rate-hiking cycle and prompting analysts to cut their few of how many more times it will move. Some economists believe the Fed will make one more move this year, depending, of course, on how things play out. “We judge inflation will need to pick up from its current pace – to a bit above 2 per cent – before the Fed acts again,” Bank of Montreal deputy chief economist Michael Gregory and senior economist Jennifer Lee said in a forecast Thursday. Governor Stephen Poloz, senior deputy governor Carolyn Wilkins and their colleagues had been in rate-hiking mode. Then, of course, things got ugly, with the latest numbers showing Canada’s economy expanded in the fourth quarter at an annual pace of just 04 per cent and analysts calling for a first quarter also with just about no growth. Business investment and the housing market stumbled, with consumers shopping at a much slower pace, as well. So the central bank called a halt this week, holding its benchmark overnight rate at 1.75 per cent and saying it will hold the line until things get better. As The Globe and Mail’s Barrie McKenna reports, deputy governor Lynn Patterson drove home that point in a talk with a business audience Thursday, saying the central bank was surprised at the sudden economic shift. Observers have now cut their expectations for rate increases, with BMO still suggesting one more this year amid chatter the Bank of Canada could even roll back some of the moves it made earlier. “Governor Poloz watered down his hiking bias [Wednesday], and [Thursday’s] speech by deputy governor Patterson did little to change the market’s dovish perception,” said CIBC World Markets senior economist Royce Mendes. 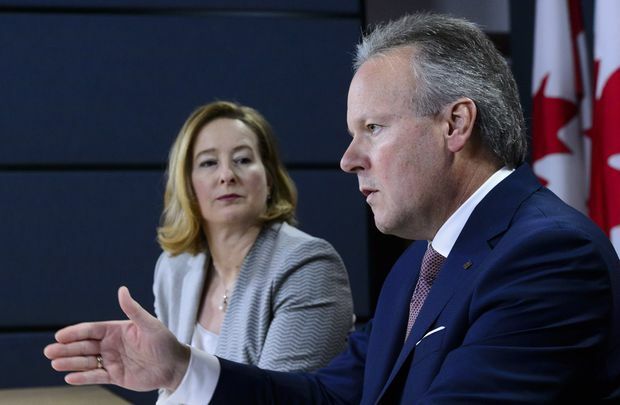 “The Bank of Canada is holding on to the narrative that there will still be rotation in demand away from consumption and housing, and toward business investment and exports strong enough to justify an eventual move towards their 3-per-cent neutral rate,” he added. The Canadian dollar has tumbled in the wake of the fourth-quarter numbers as markets expect less from the central bank. “The ECB officially joined the growing roster of growingly cautious central banks, offering more help to support growth and keeping rates lower for longer,” said BMO’s Ms. Lee. Central bank chief Mario Draghi said the ECB won’t be raising rates until next year at the earliest, and the money for the banking system also sent a message of just how cautious he and his colleagues are. “If, as seems entirely possible, the euro zone economy takes a further turn for the worse, the ECB doesn’t have much room for manoeuvre on interest rates,” said John Higgins, chief markets economist at Capital Economics. Governor Mark Carney is at the mercy of how Brexit plays out, whether Parliament approves what Prime Minister Theresa May wants, whether there’s a delay in quitting the EU or whether Britain leaves the union with no deal, the so-called hard Brexit. “Time is running out; or it already has,” said BMO’s Mr. Gregory and Ms. Lee. “The BoE does not meeting until March 21 and it will be interesting to see if, given the heightened uncertainty, it still believes it is ‘appropriate’ to have ‘ongoing tightening over the forecast period,’” they added, referring to earlier comments. Japan has its own issues, and has for some time now, and it’s almost worth not talking about the central bank’s outlook given that it’s going to do nothing. “The BoJ has been perched on the sidelines for a long time, hesitant to raise rates in the face of still disappointing growth and a clear lack of inflationary pressure,” said Mr. Gregory and Ms. Lee. The Canadian and U.S. jobs reports are sure to confound the masses. Canada created far more than expected in February, while the U.S. fell far shy of what was projected. The Canadian economy churned out 56,000 new jobs last month, because of full-time work, while unemployment held at 5.8 per cent, Statistics Canada said today. “Is the Canadian economy a dead parrot, or like the one in the Monte Python skit, maybe its just resting, since today's jobs data seem to suggest that there's a lot of life left in it,” said CIBC chief economist Avery Shenfeld. “While there's nothing in this that spells a rate hike any time soon, the market might rethink the idea that the next move is sure to be a cut,” he added. The U.S., in turn, created just 20,000 jobs, with unemployment easing to 3.8 per cent. Hydro One Ltd. is scaling back compensation for its next chief executive officer, bowing to the demands of an Ontario government order. A new CEO will now be paid a salary of $500,00, with a maximum incentive package of $1-million, the utility said today. That follows Ontario’s directive for a $1.5-million cap on what its CEO can earn. He or she will also have to help cut our electricity costs to earn the top amount. “The new compensation structure for the CEO will have two thirds of the total maximum direct compensation ‘at risk’ and dependent on meeting challenging and measurable performance targets,” Hydro One said. The maximum for other executives will be $1.125-million. The board chair will get $120,000, committee chairs $85,000, and committee members $80,000. A big day, this, with the Canadian and U.S. jobs reports. Canada's labour market has done rather well, and is one of the brighter spots of the economy, and observers expect this report to show somewhere between zero and 11,000 new jobs were created in February, with unemployment possibly dipping to 5.7 per cent. “It’s been quite the run for jobs in Canada, surging 234,000 in the five months to January, the best spurt since 2002,” said BMO’s Mr. Reitzes. Economists generally expect the U.S. report to show job creation of 185,000, with unemployment inching down to 3.9 per cent.